Can you FCC me now? It's beginning to sound more and more like LG will once again venture into the crowded tablet market with the rumored LG G Pad we've been hearing so much about. After learning the potential device could feature an 8.3-inch screen complete with 1920 x 1200 resolution, as well as a quad-core processor and 2GB of memory, we'd been waiting for the official announcement shoe to drop. While LG still hasn't said a peep about the G Pad, the Federal Communications Commission (FCC) may have just given us a peek into the South Korean company's plans. 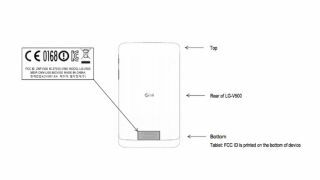 According to PhoneArena, a new filing for the LG-V500 (one of two supposed varieties of the G Pad) popped up on the FCC's site, and gave us a bit more insight into what to expect. Unfortunately, the only new information ascertained from the LG-V500 filing is the tablet's Wi-Fi and Bluetooth connectivity. The rest of the details concerning the device are still speculative, including whether it will feature a Snapdragon 800 processor, though LG has its G-series smartphones would feature the Qualcomm chip. The other purported tablet, the LG-V507L, still has yet to appear anywhere beyond Fabletown, but there's a chance the "L" could stand for LTE, meaning LG could have plans for cellular support in place. Competing with the Nexus 7 and iPad 4 may not be the only plans on LG's docket though, as one of the company's executives recently spilled the beans on a variety of possible products that may debut at IFA 2013. In a recent interview with Dnevnik.bg (via Engadget) LG's Bulgarian mobile communications head Dimitar Valev affirmed plans to bring tablets back into the manufacturer's fold. Though Valev didn't outright detail just what those tablets would be, it appears likely the V500 and V507L figure into the company's future. But that's not all, as Valev also divulged more about the rumored smartwatch LG could be developing, including the idea that it may feature flexible LCD technology. The interview also makes mention of a 6-inch smartphone and a mysterious Firefox OS device, though Valev was light on hardware specs for either. LG's Optimus G Pro already clocks in at a robust 5.5-inches, but with more and more mobile competitors reaching for the 6-inch bracket, the Korean manufacturer may not want to be left behind. None of the information thus far can be considered concrete just yet, as LG itself still hasn't made mention of any singular device, let alone a multitude of them, but with IFA just around the corner, the wait for confirmation may not be long. Is Google's new Nexus 7 worth all the hype? Check out our review to find out.